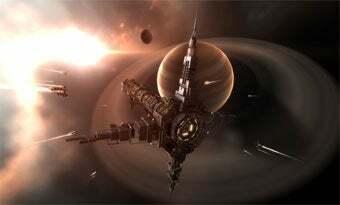 Massively-multiplayer game EVE Online has had its fair share of scandals and controversies. That's what happens when you let the gamers run themselves. But they've hardly been a deterrent to subscriptions. The largest alliance in the game was broken up by a trader on the inside and when this happened we were really worried at first because we were like, "Oh no! Everyone's going to quit!" And it was really horrible for us. That was in the morning, but a couple hours later the buzz on the forums was crazy, subscriber numbers were growing, and everybody was really excited. Because everyone was becoming complacent and bored with being the biggest alliance, and then all of a sudden now there's war and turmoil. People who used to be in the alliance were re-subscribing and everyone was really excited about it so it's not necessarily always a bad thing when this sort of stuff happens. Gotta say, despite MMOs as a whole never really grabbing my attention, it's this kind of thing that has me leaning towards giving EVE a good, hard look. You just don't find that kind of real-world intrigue in other games.